Custom 1-1 GMAT tutoring is an ideal alternative to one-size-fits-all classroom courses. Our most common GMAT tutoring package includes 15 hours of private GMAT tutoring from a recognized expert (though packages of any number of hours can be designed) and leverages The Official Guide for GMAT Review 2019 Bundle (Official Guide + Verbal Guide + Quantitative Guide). However, we can work with you by the hour, or in blocks of just 5 or 10 hours. We design a GMAT study plan that fits your timing, budget, strengths, and weaknesses. We use official practice tests to track progress and follow a GMAT tutoring process that is tailored to every student. Sessions are available in Chicago, Boston, New York and several other cities – or online using a virtual whiteboard. 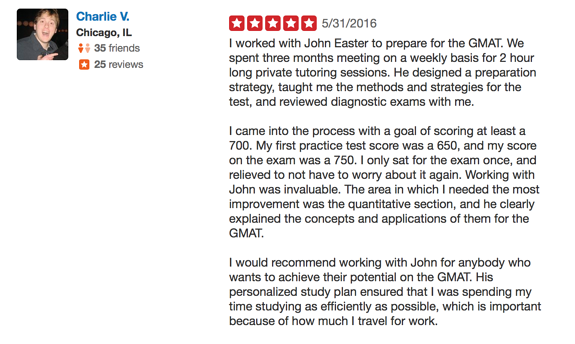 All of our GMAT tutoring is delivered by a true GMAT expert. Here is some background on one of our tutors, Chris. Taught and tutored high school students just about every day for the past two years as a full-time teacher at a high-performing charter school in Boston. Your tutor will assess your starting point and help you develop a customized study plan to help you prepare for the GMAT as efficiently and effectively as possible. We'll help you master the content and get as close to an 800 GMAT score as possible, but we also find our tutors becoming mentors as students embark upon the process of studying for the GMAT and preparing for business school applications. 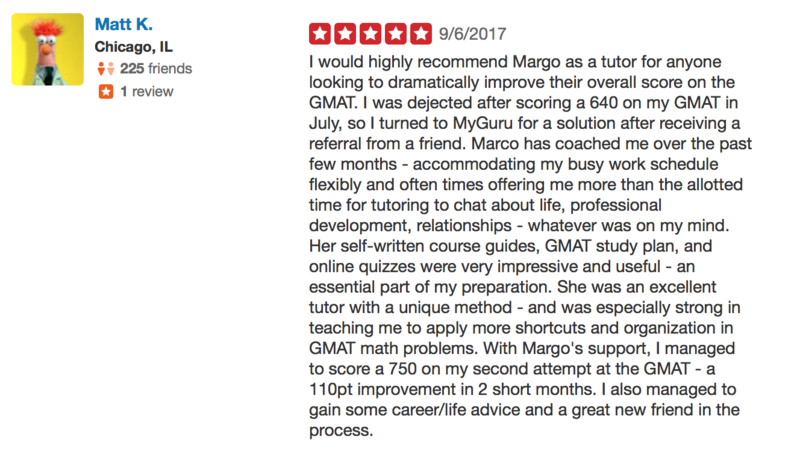 Click here to read more reviews from students who have invested in private GMAT tutoring. To read about how our GMAT tutors help people develop strategies for passing the GMAT, click here. Our base rate for private GMAT tutoring is $119, but we also offer 5, 10, or 15 hour packages which come with discounts of 5, 10, or 15%. That's a long term rate of $119 × 85% = $101.15 per hour. After the first session, if you then choose to continue with a 15 hour package, that's a total cost of $101.15 × 15 hours = $1,517.25. We encourage you to check around for a better value - one well known national test prep company charges $2,499 for its 15 hour, 1-on-1 tutoring package. We also offer an intensive classroom training program that is the perfect choice if you'd like to study in class. It comes with 48 hours in a small class setting, all study resources, 3 hours of private tutoring, and free course retakes for 1 year. Click here to learn more. Check out our GMAT blog for the latest student testimonials, GMAT concept reviews and explanations, and advice on MBA admissions.